We are thrilled to announce the release of the Baroque Chamber Orchestra of Colorado's third CD, entitled Corelli's Circle. The CD is now available for purchase at our online store! The recording features music of virtuoso violinist Arcangelo Corelli and composers from his circle of influence in London, including Handel, Geminiani, Stanley, and Avison. The cover portrait was created especially for our album by Denver based artist Heather Delzell: a contemporary portrait of Corelli, as if he were alive in 2018. For more information, see our Recordings page. We're excited to share some big news. Bloomberg Philanthropies' Arts Innovation Management program (AIM) has just expanded to Denver, and the Baroque Chamber Orchestra of Colorado has been selected as a grantee! The invitation-only program seeks to strengthen the organizational capacity and programming of small and mid-size cultural organizations within seven cities throughout the US. Through the $43 million multi-year initiative, Bloomberg Philanthropies will provide unrestricted general operating support as well as arts management training in areas that include fundraising, strategic planning, marketing and board development. "This is an amazing opportunity for our orchestra, and we are honored to be selected to participate in AIM," said BCOC Artistic Director Frank Nowell. "The support provided by Bloomberg Philanthropies will help us continue and expand our work to inspire and engage audiences through live, collaborative performances of Baroque music." View this inspiring video to find out more about the great work the Bloomberg Philanthropies' AIM program has already done with other arts organizations around the country. The Baroque Chamber Orchestra of Colorado is pleased to announce our 2018-2019 season, with a subscription Masterworks series and the new Confluence series. The Masterworks series includes four programs and 10 performances: Handel and Purcell - The London Connection, Bach for the Holidays, A Taste for Baroque, and Monteverdi’s Orfeo. Season subscriptions are available for the Masterworks series, at a 15% discount over individual tickets. The new Confluence series features innovative collaborations and community partnerships. 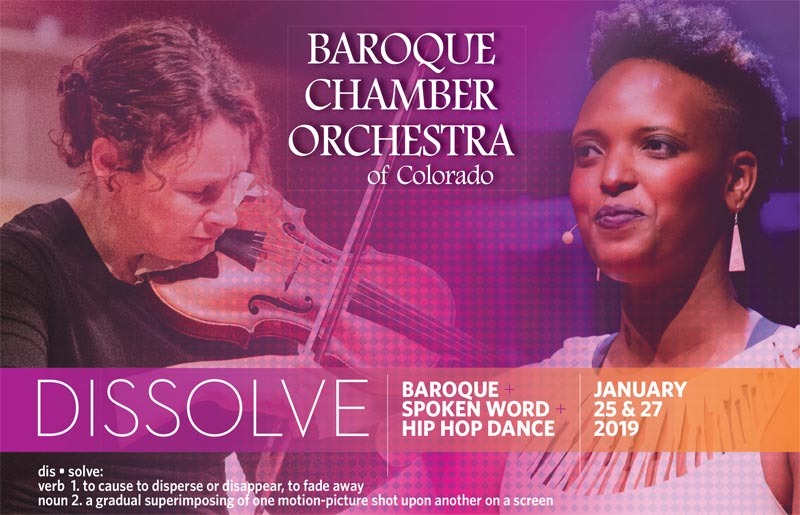 The Confluence series comprises three programs and seven performances: Art from the Heart (with artist Marianne Mitchell), Spoken Word Baroque (with poet and spoken word artist Assetou Xango), and Spirited Conversations (a joint event with Colorado Chamber Players). View the Masterworks Series brochure. The Baroque Chamber Orchestra of Colorado's "Bachfor2" series of videos features BCOC violinists Cynthia Miller Freivogel and Martin Davids performing Martin’s arrangements of Bach fugues for two violins.